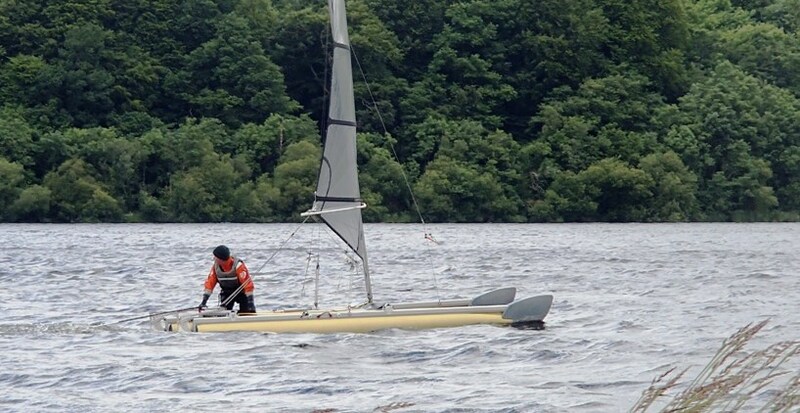 Catapult was back a favourite venue at for the 2016 Nationals and the fun races making up the Bala Gala.The south-west breeze throughout the extended weekend gave excellent conditions for the fun races, all completed. PAIRS RACEAs is traditional, the Bala Gala kicked off with the Pairs Race, pairing experienced helms with helms designated as improvers (or at least carrying higher personal handicaps) round a port-rounding triangle. The pair of Alastair and Paul fought successfully for the pin end of a tight starboard-end start, only to see that the first mark could be laid directly from halfway down the line, and closer. Dermot Mangan began as he meant to go on for the weekend, pushing hard to the front. With a good lead, he had to look back to search for partner Stuart Ede (photo below) only to find him miles back---Stuart had competed so hard that he was over the start line, discovering this only when he passed the spit again down-wind, after completing a half-lap, turning back to repeat it alone. This gifted chasing pair Alastair and Paul the lead, held to the end, with Paul able to defend when Syd Gage came up fast, luffing him away on the reach as Alastair rounded onto the final beat. The final twist was the disacovery that the windward mark was drifting down-wind fast, needing a new search each time as the beat got shorter and shorter. TEAM PURSUIT RACE To round off the Bala Gala, the Team Pursuit Race, a new event, used John Terry's personal handicaps to set off three teams off at 4-minute intervals. The second and third groups stuck together tightly, showing the accuracy of the handicapping. The Hot Shot team of George John T and Gareth pulled up on the team ahead (helped by riding a burst of stronger breeze on the downwind leg) just catching the next group, but team two of Stuart Dermot Paul and Syd largely defended their places ahead. In the high handicap group, Alastair carrying the sympathetic handicap John T gives for age (both boat and helm) was away first, chased by Chris and then Damien, and the front two were never threatened, to take the event. On the final lap, John Terry for the Mixed Marauders rode a reaching breeze fast after Paul, to just catch him at the gybe mark and hold on to give his team the win.